I've heard many green writers extol the virtues of Kids Konserve lunch kits, and I am thrilled to have finally had firsthand experience trying one out myself. These super stylish and savvy waste free lunch systems really streamline and simplify the process of packing an eco-friendly lunch. I especially like the cute caterpillar pattern, shown above, and available for purchase here for $45. 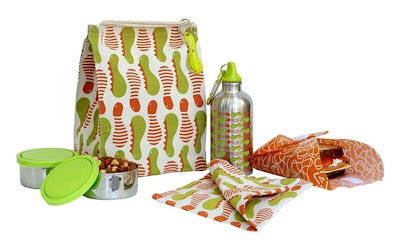 The BPA-, lead- and phthalate- free lunch kit comes complete with one cloth napkin, one 304 food-grade stainless steel beverage bottle, one food kozy (a reusable alternative to plastic baggies, plastic wrap and foil. Recycled, FDA approved, non-toxic, non-leaching, recyclable PE plastic) and two 304 food-grade stainless steel food containers -- all packaged in a recycled cotton sack -- a chic, eco way of brown bagging your lunch! The fun, modern designs on Kids Konserve lunch kits are obviously geared toward kids, but as a young at heart mom, I'd happily tote one myself! Kids Konserve also recently added the Whimsy Snak Pak to their collection. A smaller version of their lunch kit, the reusable Snak Pak includes a recycled cotton sack, cloth napkin, 2 small 304 food-grade leak-proof stainless steel containers, a food kozy and a recycled aluminum name tag. This mini system was created for moms on the go who need to pack snacks for their toddlers, and for kids who may be opting for a hot lunch at school, but need to take along an afternoon snack. 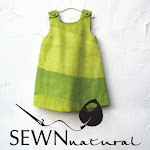 Product Photography by Emily Dodge (EcoProductPhotography.com) and Helga Sigvaldadóttir. These look fantastic! I would take one to work, just to put a smile on my face all day. I am addicted to little kids' lunch bag. Thanks for sharing this. I'm posting on my design blog next week linking it to your blog.